It wasn't too terribly long ago that I was a teenager...but it seems like it was in another life time. I remember crafting at a tiny desk in the main area of the basement talking to my dad about how I was going to move to Boston and one day be a crafter, or maybe an interior designer. I remember what I was making at the time too. They were mixed media collages of women from the 40's and 50's and I was using vintage magazine clippings, my dad's old rusty nails, forgotten picture frames and anything I found laying around. Those collages hung in my little sister's room for quite a while but I'm not sure if they are still there. They were clever little collages and each had a household chore theme (laundry is the only one I remember). I'll see if I can't find them the next time I'm visiting and snaps some photos to show you. 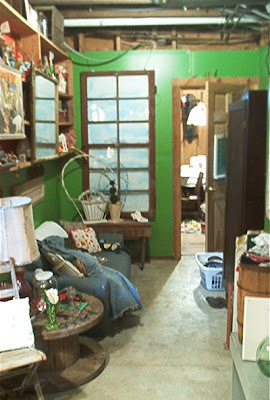 ANYWAY...this is the space in my parent's basement where I did all of my daydreaming...and also stashed all of my garage sale finds. The photos are awful...but they are the only ones I have. This was actually my bedroom too. When I went away to college my parent's gave my upstairs room to my little sister, so when I was home I had no space of my own. I then claimed the "library room" in the basement as my own. 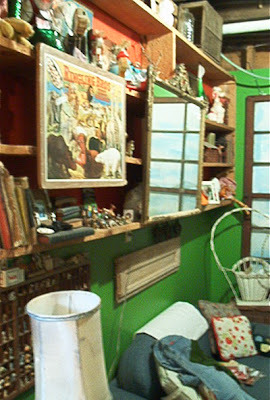 My dad had built shelves there years before after my mom bought a hundred boxes of antique books at an auction. She's since realized that she could never read so many outdated books and has gotten rid of most of them. But the shelves proved useful for my collections. 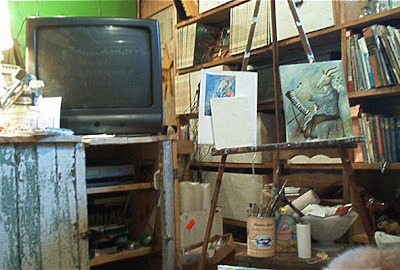 That TV cabinet was the first piece of furniture I ever made. I found old cabinet doors in the loft of the barn and found scraps of pine to make the rest. The construction of it is so unbelievably poor...but I got some good use out of it. I also had my easel set up. That little painting was a gift for Ben. I tried so hard to paint in the style Chagall, one of his favorite artists...but I have to say that he was unimpressed...lol. I'll stick with what I know I suppose! My love of milk glass started early. Especially because I found them at yard sales for 5 and 10 cents a piece! I also started my mix and match vintage dishware collection in anticipation of getting my own place (I always think ahead). I am still using and loving them! I painted the drywall green and displayed my collections everywhere. I found old windows that were original to the house (built in the 1700's) and hung them from the ceiling and painted sky behind them. I even had a two way double fish tank stand filled with my finned goldfish friends...but I somehow don't have a picture of it. This space only has one small window, but it had a door and stairs with access to the outside! Yippie! No tiptoeing through the house when I got home in the later hours of the night. And there's Magic on my bed! 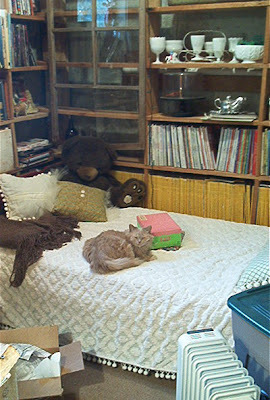 That shoe box next to her is filled with stickers I had been collecting since I was a real little kid. I never stuck them to anything for fear of regret...they weren't exacting movable...lol. I think I brought that box with me to Boston...for some strange reason. I really enjoyed reading this Crystal. 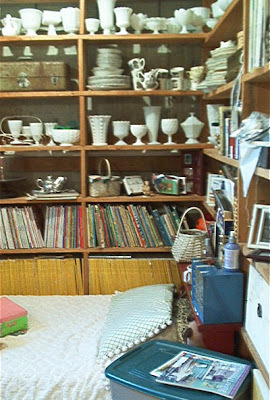 Great post and I love your room especially all of the milk glass. what an amazing place. Full of energy and dreams. I'm glad you have the photos. Thanks for posting about them. I dream, still, of painting all over the walls: flowers, trees, clouds, birds. so interesting to see all your lovely collections even back in the day! I too loved to collect stickers but never used them for fear of ruining them, haha!